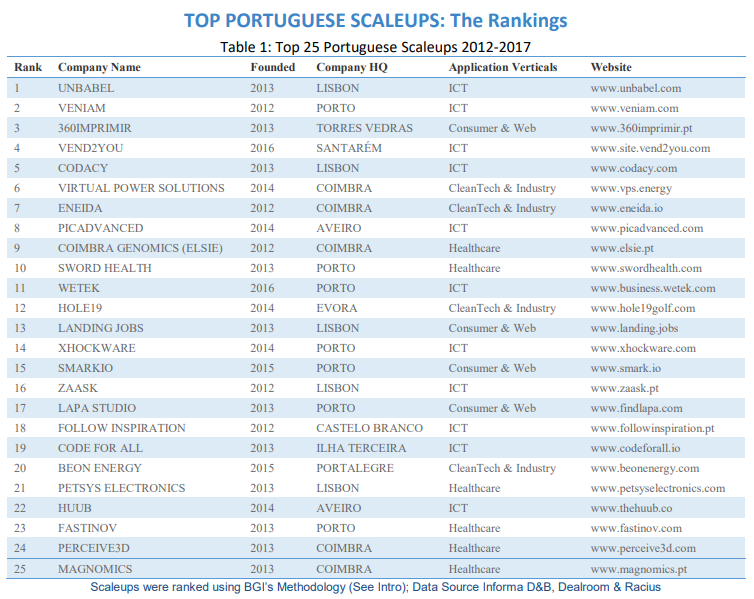 The Scale-Up Portugal 2018 report reveals the top 25 Portuguese scale-ups, gender gap, the top five industries and provides the current state of investments in Portuguese startups. The report by EIT Digital, Building Global Innovators and their partners takes a data-driven approach at understanding key elements within the Portuguese entrepreneurial and innovation (E&I) ecosystem. Some of these elements include funding structure, investor profiles, economic impact and startup business models, among several others. Researchers arrived at the top 25 by considering the total funding received, total revenues, capital to revenue ratio and jobs created of candidates with Portuguese origin, with less than five years of operation (i.e. between 2012 and 2017). The Portuguese entrepreneurial and innovation ecosystem relies significantly on venture capital financing from outside Portugal with 72.6 percent of total funding in the Top 25 coming from non-Portuguese sources, mainly from the U.K. and the U.S. There is a steady increase in the number of employees within the top 25 with a cumulative value of 850 employees. Even though number of female employees is growing steadily there is a significant gap (30 percent) between male and female employees. Part-time employee figures are almost ignorable and significantly low (just over 1 percent). ICT is by far the largest contributor to employment generation, followed by consumer a web within the top 25. Similarly, female representation is greatest within the ICT vertical followed by consumer and web. A breakdown of investment sources within the top 25 and the ecosystem as a whole show that the U.S., United Kingdom, Belgium and France are the largest contributors of VC financing from abroad, with a combined investment of €92 million in the Portuguese Venture Ecosystem (PVE). Investment sources at a country level indicate that Portuguese investors are leaders in terms of frequency of investments and total sum of investments (€30 million in top 25 and €41 milllion in PVE). ICT received the most funding within the top 25 at €73 million and within the Portuguese Ecosystem as a whole at 59.3 percent. ICT also appears to be the largest contributor to revenue growth within the top 25 with €24 million, and it is the largest contributor to job creation. The second largest contributor to revenue growth and job creation is consumer and web. Medical devices and health IT receive the second largest share of financing within the top 25 and PVE (16.7 percent). EIT Digital is a leading European open innovation organization that brings together a partnership of over 150 top European corporations, small businesses, startups, universities and research institutes. Building Global Innovators (BGI) is a deep innovation global accelerator based in Lisbon (Portugal) with operations in Cambridge (U.S.). BGI was born from the MIT Portugal Innovation and Entrepreneurship Initiative (IEI) -- launched to support Portugal’s goal to strengthen its capacity in business education, technological innovation and entrepreneurship.